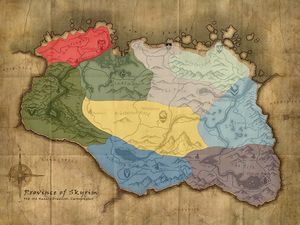 Skyrim has nine holds, or regions. Each hold is governed by a jarl who lives in the region's primary city. In the absence of a king, the holds have effectively split apart from one another, and some holds are even actively at war with each other. One consequence for you is that guards in each hold only care about crimes you have committed within that hold: any bounties you acquire are tied to a specific hold. Many of the holds have distinct climates, such as the Rift being an aspen forest, Falkreath Hold being a pine forest, and Eastmarch being tundra. Snowy mountain environments are also found in part of most holds. Eastmarch — A hold in eastern Skyrim, with its capital in Windhelm. Falkreath Hold — A hold in southern Skyrim, with its capital in Falkreath. Haafingar — A relatively small hold in northwest Skyrim, containing the provincial capital Solitude. Hjaalmarch — A hold in northern Skyrim, with its capital in Morthal. The Pale — A hold in northern Skyrim, with its capital in Dawnstar. The Reach — A hold in western Skyrim, with Markarth as its capital. The Rift — A hold in southeast Skyrim, with its capital in Riften. Whiterun Hold — A hold in central Skyrim, with its capital in Whiterun. Winterhold — A hold in northeast Skyrim, with its capital in the city of Winterhold. In addition, the Tribal Orcs faction and Raven RockDB track their crime separately from any of the Nord holds. This page was last modified on 25 July 2017, at 07:14.